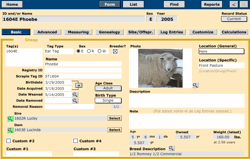 FlockFiler Lite is a computer database for keeping health, management, and breeding records of sheep. FlockFiler Lite is suitable for any shepherd and for flocks of any size. Even though FlockFiler Lite was designed for sheep records, goat herders are using it for their goat records too. Download the fully-enabled demo. When you are ready, purchase the license for $49.95 and receive your License Code online instantly. Written documentation is provided for free as a PDF document. This document is bundled with the installation, but you can download just the PDF document separately if you want to read it first before installing FlockFiler. View some example movies in your web browser. These narrated videos illustrate some of the many features. Check out the Frequently Asked Questions page. It includes answers too. Browse these screen images of FlockFiler Lite. These are the from the Figures found in the User Guide section of the documentation. Everything you type into the database is fully searchable so that you can find it later. Lineage and breed composition are calculated automatically from dam and sire's info. Display lists of all siblings and all offspring of a particular sheep. Display ancestry of the sheep in a genealogy diagram. Optionally include your choice of field to display next to each sheep on the diagram too (e.g. birth type, wool color, or horn status). Score quality of wool (many aspects), and condition of body, feet, udder, teeth, soundness, ease of management, ease of lambing, and mothering ability. Track the sheep's weight at birth, weaning, and at six more dates of your choosing. 60-day, 90-day, and 120-day weights are automatically estimated from the weights you provide. Keep a datestamped log of everything done with each sheep. Log entries may optionally apply to multiple sheep simultaneously such as notations of vaccinations or shearing. Includes a handy dosage calculator to help you determine how much of something to administer for your sheep's weight. Includes a date planning tool to assist you in planning when to breed, birth, vaccinate, wean, and sell. Has six custom fields that you can label yourself to keep track of any additional things you need. FlockFiler32 FlockFiler Lite 2.0 is a FileMaker 14 runtime database project. Its requirements are that of this version of FileMaker itself (Windows 7 (SP1)/8/8.1/10, MacOS X 10.9 - 10.13). FlockFiler64 FlockFiler Lite 2.0 is a FileMaker 16 runtime database project. Its requirements are that of this version of FileMaker itself (MacOS X 10.11 - 10.14). The Windows version of FlockFiler64 has not yet been released as it is still in development and testing. You do not need to buy FileMaker Pro separately. FlockFiler Lite is a stand-alone, complete solution built with the "runtime" FileMaker database technology of FileMaker Pro Advanced.